Ramps (aka. 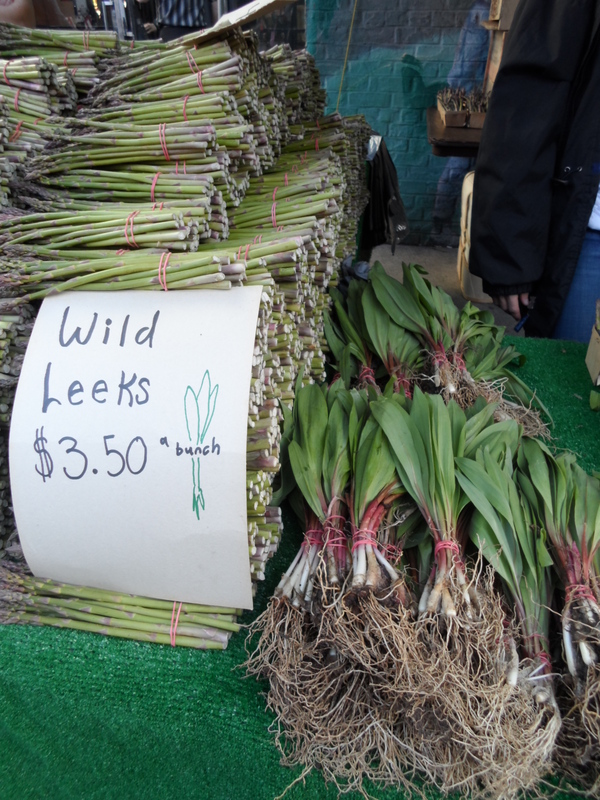 wild leeks) are finally coming into season and I cannot WAIT to get my first batch and cook them up at home. It’s been a long cold winter and not only are seasonal produce coming in late but, believe it or not, even the Canadian geese have been laying their broods several weeks late. Welcome to Canada. Last night I received an invitation for an early Saturday morning trip to the St. Lawrence Market from a couple of very good friends. The plan was for them to swing by my place around 7am so that we could head to the market and hopefully get there before the crowds fill the place up. Count Me In!! On Saturdays, the North side of the St. Lawrence market is open to the public with farmers and artisans presenting their produce and prepared goods to the public. Not only is food available but flowers, art, jewellery, clothing and more. It’s still early in the season but the stalls inside were filled and more and more of the stalls around the perimeter of the building are beginning to set up as well. My focus this morning was ramp hunting and getting produce for the new juicer that I purchased earlier this year and absolutely LOVE! Yes, I know… another kitchen gadget, a bit bulky, but oh so worth it. Marvin’s Produce has two stalls, one inside (run by Marvin himself) and the second stall outside to the right of the front doors on the north side of Front Street (run by his mother). The produce comes from the same family farm in Flamborough (Marvin’s Garden). There they were, the first bunches of ramps of the season next to the new asparagus heaped on the corner of their stall. Depending on the weather, it’s possible that they will have a supply for at least a month. Usually it’s only the month of May but with all of the crops starting late, you should be able to find them at least until mid-June (fingers crossed). It’s a very short season so get them while you can. What, you may be wondering, is a ramp? 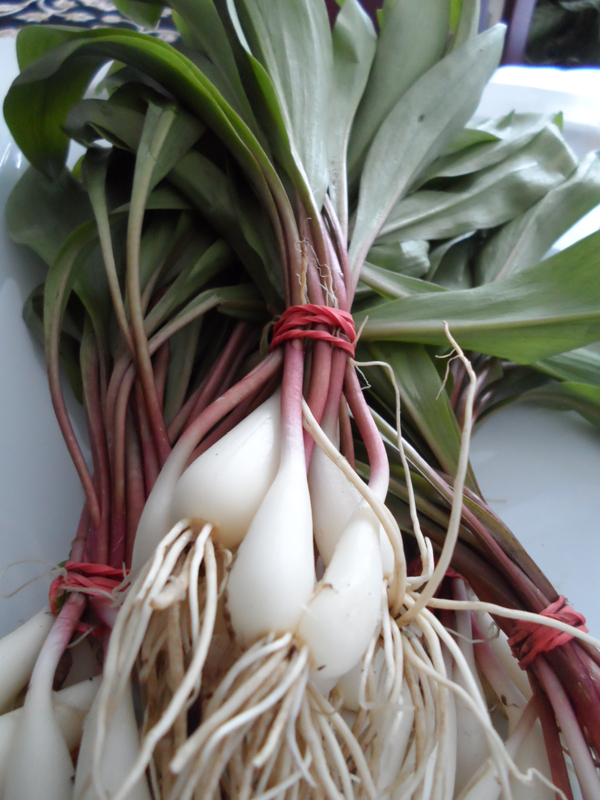 Well, ramps are also know as wild leeks (or Allium tricoccum) and are a member of the onion family. They look somewhat like scallions with their white bulb at the bottom, but have a purplish stem and flat green, somewhat delicate, leaves at the top. All parts are edible – bulb, stalk and leaves. These delicious gems are among the first plants to usher in spring. They are not cultivated but foraged by the farmer and owner of the stand and are from the forests of Waterdown, Ontario. They grow in patches in moist forested areas and, since we have had an incredibly wet spring, they should be popping up, in great abundance, all over the place. Although harvesting wild leeks is legal in Ontario (commercial trade is illegal in Quebec and personal foraging is regulated to 200g per season due to over-harvesting issues), it is recommended that no more than 5% – 10% of a patch is taken to ensure it can regenerate. So be kind to the plants that you might come across while foraging, or talk to your supplier/farmer about where the ramps are coming from and who is harvesting them. While the strong scent of onion is a good indication that you’ve found the right plant, it goes without saying that if you’re not sure about a plant you pick up in the forest ~ don’t eat it!!!! So what to do with your delicious little ramps once you get them home? Whatever your heart desires… or whatever your recipe calls for. Unlike scallions, ramps are very flavourful. It’s an onion that has been enhanced by a spicy garlic kick. You can add them to anything or eat them on their own. Throw them raw in salads, chop them up and add them to mashed potatoes, use the leaves in your sandwiches instead of lettuce, you can even lightly sauté or steam them and serve them as a wonderful side dish. In other words, you can add them to ANYTHING!! 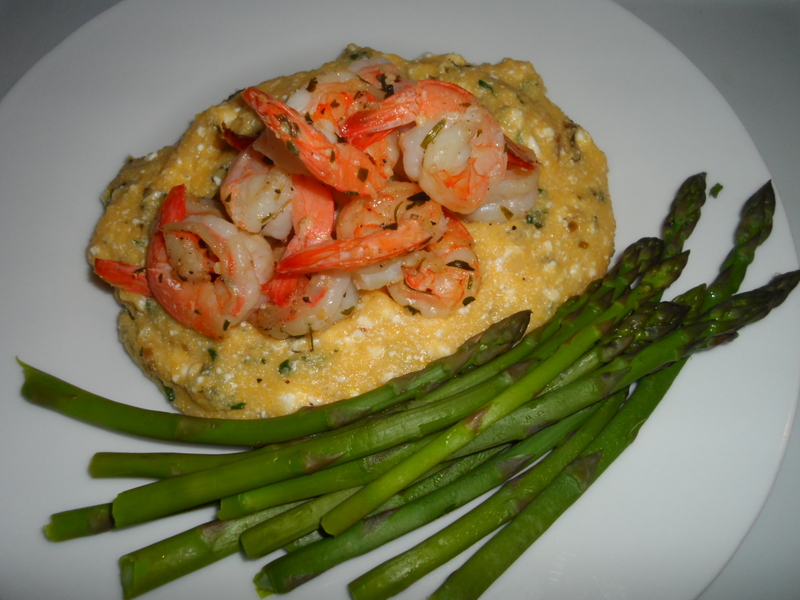 Today’s harvest of ramps have been brought home to be added to my recipe for Lemon Polenta with Ricotta & Ramps served with Garlic Shrimp and Steamed Asparagus….. stay tuned for the recipe!! Posted in farmers, side dishes, vegetablesTagged farmers markets, onions, ramps, seasonal vegetables, wild leeks, wild vegetablesBookmark the permalink.